Here are the latest Happy Beaks Snap of the Month Terms and Conditions. All terms and conditions are subject to change. 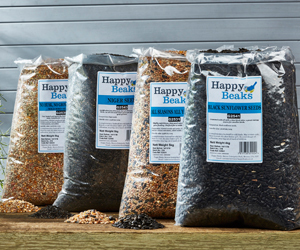 The prize for the “Happy Beaks Snap of the Month” winner is a 12.75kg bag or tub of bird feed, chosen by the winner, along with a feeder, chosen by Happy Beaks. The method of choosing the winner may vary from month to month, and this will be made clear on social media and/or the Happy Beaks blog. All photos must belong to the entrant. All photos must relate to bird feeding, birding or anything related to the topic of ornithology. We may at times choose images of other parts of nature, but only due to a connection to birds in some way shape or form. You cannot re-enter an image on different months. By entering the competition you give us the right to share your image (with credit). If the prize is not claimed after a set period, or we feel that the entrant has not entered honestly, we will pick another winner. The winner will be notified via social media and/or email. The prize is non returnable or refundable and has no alternative cash value.